I read this article and found it very interesting, thought it might be something for you. The article is called Budget 2019 May Pump Money Into Ayushman Bharat But Bleed Other Core Health Schemes https://www.indiaspend.com/budget-2019-may-pump-money-into-ayushman-bharat-but-bleed-other-core-health-schemes/. New Delhi: Health seemed to have finally become a part of India’s political agenda when Pradhan Mantri Jan Arogya Yojana, popularly known as Ayushman Bharat scheme, was launched in September 2018, less than a year from general elections. But this ambitious project to provide health insurance cover of upto Rs 5 lakh to 500 million poor families cannot succeed if India does not boost health spending in its upcoming budget, said experts. When union finance minister Arun Jaitley announced the scheme, dubbed as ‘Modicare’ because it was driven by Prime Minister Narendra Modi, it was allotted only Rs 2000 crore ($300 million) in the 2018 budget. This was just a fifth of what it was expected to cost, Rs 10,000-12,000 crore ($1.5-1.8 billion), according to the government’s own projections. “There is no paucity of funds,” union health minister J P Nadda told IndiaSpend during an interview in March 2018. The initial allocation, he said, was only a “token sum”. There are also concerns that in this election year Ayushman Bharat will draw attention and funds away from the government’s core health schemes, already suffering for want of resources. Thus, “a lower priority programme from the central government’s point of view will get higher funding and the core activities that the central government is responsible for will be set aside for the moment”, said K Sujatha Rao, former union health secretary and author of Do We Care? India’s Healthcare System. This budget, post-Ayushman Bharat, “.. is an historic opportunity to address supply and demand side constraints”, said Oommen Kurian, Fellow at the think tank, Observer Research Foundation, working on public health and given health is a state subject, states need to be given more resources and flexibility, he added. However, many states, are resentful about how the centre is cornering the credit for the scheme. For example, when entitlement letters featuring Prime Minister Modi and various other government schemes were sent off to beneficiaries of Ayushman Bharat in West Bengal, the state pulled out, complaining that it had not been consulted. India is still struggling to control infectious diseases--it has the highest number of tuberculosis and multidrug resistant tuberculosis patients in the world, leprosy cases are rising though the disease has been ‘eliminated’ and while malaria case declined, acute encephalitis syndrome cases and deaths are rising, IndiaSpend has reported. Even as health crises in India grew, unspent funds of National Health Mission (NHM)--India’s largest health programme on maternal and child health--with states over five years to 2016 increased by 29%, IndiaSpend reported in August 2018. Despite a 40-year-old nutrition programme--Integrated Child Development Scheme--- every third stunted child in the world is Indian. Malnourished children struggle to stay healthy and find it hard to catch up with their peers in classrooms and at workplace. Malnourishment may have cost India upto $46 billion (Rs 3.2 lakh crore) in terms of income opportunities lost--double of what India spent on health, education and social protection schemes in 2018-19 Union budget ($21.6 billion or Rs 1.38 lakh crore), IndiaSpend reported on January 3, 2019. Despite being the sixth largest economy in the world, India has one of the most underfunded healthcares in the world. In 2015, the latest public spending figure available, the Indian government spent 1.02% of its gross domestic product (GDP) on healthcare, a figure which remained almost unchanged in six years since 2009--and amongst the lowest in the world, as we reported earlier. While India had planned to spend 1.28% of its GDP (budget estimates) in 2017-18, it is still below the spending by most other low income countries that spend an average of 1.4% of their GDP on health. Sri Lanka spends about four times as much as India per capita on health and Indonesia more than twice. The proportion of GDP spent on health in the Maldives is 9.4%, Sri Lanka 1.6%, Bhutan 2.5% and Thailand 2.9%, the 2018 National Health Profile noted. Without adequate funding, government services remain poor in access and quality, pushing most Indians to private healthcare. This is why Indians are the sixth highest spenders on private healthcare globally and why 55 million Indians are driven to poverty every year, as IndiaSpend reported in July 2018. There has been a steady rise of healthcare spending from 2010 to 2018. The health budget in 2018 is more than double of that in 2010. However the actual picture becomes clearer when we see as healthcare spending as a share of total government expenditure. While the United Progressive Alliance-2 (UPA-2) government under Prime Minister Manmohan Singh steadily increased the health budget’s share between 2010 and 2014, peaking in 2010, there was a decline in 2012 and 2011. The National Democratic Alliance-2 (NDA-2) under Narendra Modi has brought the health budget’s share above 2% of total expenditure in the last four years. The average share of health budget was 1.83% during UPA-2 and is 1.99% during NDA-2. 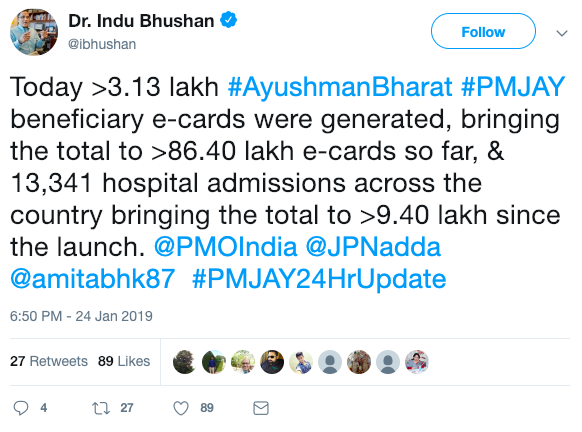 Being an election year, the allocations for Ayushman Bharat are expected to dramatically rise. The scheme may become “NDA’s MNREGS” (Mahatma Gandhi National Rural Employment Guarantee Scheme, the UPA’s flagship poverty alleviation programme), said Kurian. The new initiatives will be at least partially supported by reallocating existing health resources, he pointed out, taking funds away from key areas especially the NHM. Besides funding, there are fears that Modicare will end up promoting private healthcare. In November 2018, the government issued a note about incentivising private players to set-up hospitals in tier-1 and tier 2 cities through land allocation, funding and fast-track clearances, The Wire reported in January 2019. States, worried that the centre will grab credit for the scheme in an election year, as we said earlier, are pulling out of it -- Odisha, New Delhi, Telangana didn’t sign up for the scheme, while West Bengal and Chhattisgarh pulled out in January 2019. “The centre must co-brand the scheme with the states and at least for the initial years, commit much more resources so as to build capacity at the state level to run such a complex scheme,” Kurian said. Another problem, he said, was that more than half the Health and Wellness Centres built in 2018-19 -- these were supposed to provide comprehensive primary care including for non-communicable diseases as part of the scheme -- are in non high focus states ie those that are already economically better off. The centres should have been first rolled out in regions which are deprived -- high priority districts, high focus states and lastly, non high focus states in that order, he pointed out. Also, there should a policy to stop the takeover of hospitals and pharmaceutical companies by foreign buyers and more funding for health infrastructure in areas with poor services and support for small and medium non-profit hospitals, she said.